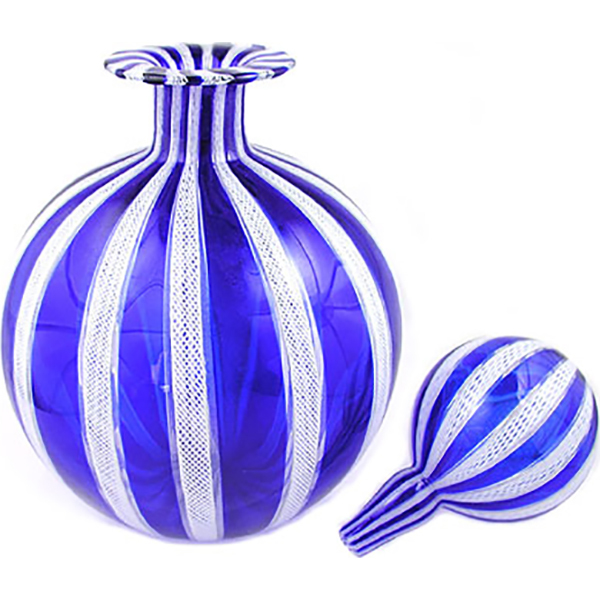 White zanfirico Murano glass canes are mixed with blue colored crystal cane to create this beautiful Venetian glass bottle with stopper. Both the bottle and the stopper are mouth-blown by artisan glass blowers using traditional methods. Zanfirico is the name for the white lattice work on the bottle. Approximate dimensions: 10 inches tall w/stopper by 6 1/4 inches in diameter. Mouthblown, Handmade in Murano, Italy.